SAN ANTONIO (CN) – The cellphone owned by the gunman in Sunday’s Baptist church shooting has been flown to an FBI lab in Virginia in hopes that experts there can unravel motives for the massacre that left 26 people dead and 20 wounded. “We are working very hard to get into the phone and that will continue until we find an answer,” FBI Special Agent Christopher Combs said Tuesday in a televised news conference. Law enforcement officials offered new details into the largest mass shooting in Texas history at a news conference Tuesday morning, less than 48 hours after the attack on the First Baptist Church in Sutherland Springs, where the dead ranged in age from an unborn child to 77 years old. All of those killed have been identified and next of kin notified. But authorities declined to release the victims’ names until confirmation is received from the Bexar County Medical Examiner’s Office, which could come late Tuesday or sometime Wednesday. As many as 14 children and a pregnant woman are said to have been killed, as well as eight members of a single family. Twenty people were injured and transported to San Antonio hospitals, where 10 remain in critical condition. Federal authorities launched a high-profile legal battle with Apple in 2016 to unlock San Bernardino terrorist Syed Farook’s iPhone 5 in the wake of the Dec. 2, 2015 shooting that killed 14. Apple resisted a judge’s order to help the FBI, citing its commitment to protect users’ privacy. The FBI successfully gained access a month later, without Apple’s help. The FBI spent $900,000 in their efforts to access Farook’s iPhone, U.S. Sen. Dianne Feinstein, D-California, revealed during a Senate Judiciary Committee oversight hearing in May of this year. Police arrived to the bloody scene at the small church within four minutes of receiving the first 911 call for an active shooter situation on Sunday morning, law enforcement officials said Tuesday. They remain tight-lipped about how the grisly shooting unfolded inside the place of worship some 30 miles southeast of downtown San Antonio, but a video recording is being analyzed by investigators. “Isn’t it great that we can gather here and just praise the Lord and warm up just praising his name,” Pastor Frank Pomeroy asked the congregation within the first few minutes of their Oct. 29 service. Pomeroy’s 14-year-old daughter, Annabelle Renee Pomeroy, is among the dead, her family said Monday. The pastor and his wife, Sherri, were both out of town when the gunman opened fire on the congregation. “Most of our church family is gone, our building is probably beyond repair and the few of us that are left behind lost tragically,” Sherri Pomeroy told reporters on Monday. Church services at the white, wood-framed building began at 11 a.m. Sunday. Authorities say Devin Patrick Kelley, 26, began firing from his Ruger semi-automatic rifle at around 11:20, but have not released a timeline on how long he was inside the church. Authorities have said a domestic situation involving the gunman’s mother-in-law may have been the motive behind Sunday’s carnage, but investigations are still ongoing just over 48 hours later. The gunman was not on any FBI database but authorities hope to learn more about his past contacts and movements from his cellphone. Meanwhile, troubling new details have emerged about the military’s failure to report the gunman’s bad conduct discharge to the FBI’s National Criminal Information Center database. The Air Force veteran received a bad conduct discharge in 2014 for assaulting his spouse and child, which would have prevented him from possessing or purchasing firearms. Kelley also briefly escaped from a mental health center in New Mexico in 2012, according to Houston NBC affiliate KPRC. The Republican chairman of the House Armed Services Committee, Rep. Mac Thornberry, called the Air Force’s failure “appalling” in a statement on Tuesday. “I am concerned that the failure to properly report domestic violence convictions may be a systemic issue,” said Thornberry, a Texan, adding that his committee would conduct “comprehensive oversight” over the military investigation initiated by Air Force Secretary Heather Wilson. U.S. Sen. John Cornyn, R-Texas, announced on the Senate floor Tuesday plans to file a bill that would offer incentives to all federal departments and agencies, including the military, to upload the required conviction records into the national database. 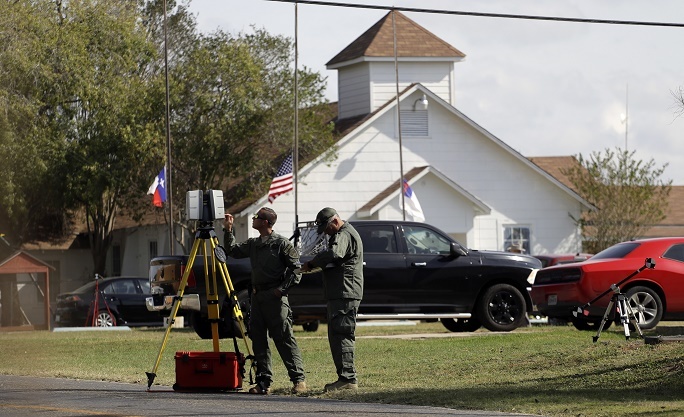 More than 130 officers were still processing the crime scene on Tuesday afternoon in Sutherland Springs, home to the latest mass shooting in the United States and the largest one in a place of worship. Authorities said they hoped to finish the crime scene investigation and all forensic analysis by Wednesday night. “Obviously this is a massive crime scene,” Freeman Martin, regional director of the Texas Department of Public Safety, said.